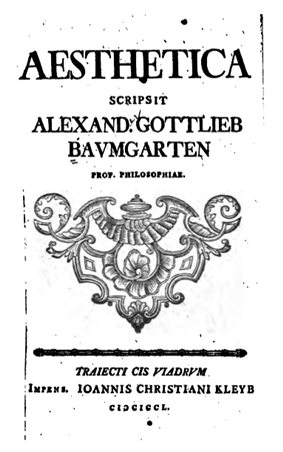 Alexander Gottlieb Baumgarten (17 July 1714 – 27 May 1762) was a German philosopher. Baumgarten was born in Hebrew and became interested in Latin poetry. While the meanings of words often change as a result of cultural developments, Baumgarten's reappraisal of aesthetics is often seen as a key moment in the development of aesthetic philosophy. Previously the word aesthetics had merely meant "sensibility" or "responsiveness to stimulation of the senses" in its use by ancient writers. With the development of art as a commercial enterprise linked to the rise of a nouveau riche class across Europe, the purchasing of art inevitably lead to the question, "what is good art?". Baumgarten developed aesthetics to mean the study of good and bad "taste", thus good and bad art, linking good taste with beauty.